New Pics From Isha Ambani's Haldi Ceremony Are Going Viral. Seen Them Yet? The gorgeous pictures are from the couple's pre-wedding Haldi ceremony organized in Udaipur over the second weekend of December. Isha Ambani Piramal with husband Anand Piramal. Two lovely new pictures from Isha Ambani and Anand Piramal's Haldi ceremony are currently going viral on the Internet. Shared this morning by designer Sabyasachi Mukherjee on Instagram, the first photograph shows a smiling Isha Ambani in a beautiful yellow lehanga designed by Sabyasachi, with an elaborate necklace and matching earrings completing her look. The second one, which has collected over 75,000 'likes' in less than three hours, shows her posing with husband Anand Piramal in colour-coordinated outfits. The pictures have collected hundreds of comments since being shared online. "Love their outfit coordination...elegant," writes one person in the comments section. "Beautiful couple," says another. 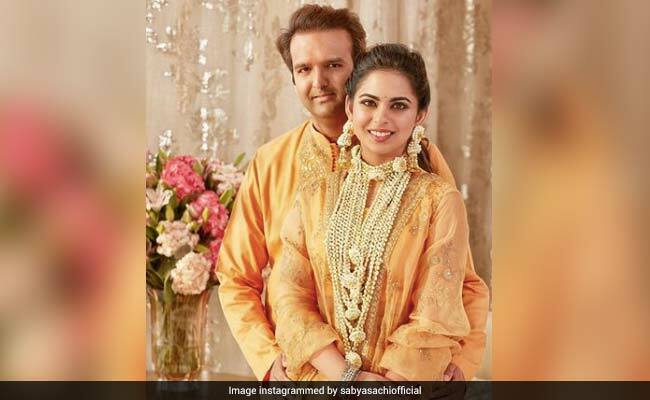 Isha Ambani married Anand Piramal in a lavish ceremony in Mumbai on December 12.Before that, star-studded pre-wedding functions were hosted by their families in Udaipur. The wedding at Mukesh Ambani's multi-storey Mumbai home Antilia was followed by two receptions - one at newlyweds Isha Ambani and Anand Piramal's new home, Gulita, and another at Jio Gardens in Mumbai.